For artists, the sky has always been an endlessly fascinating subject to paint. When we wake up, we look outside and see the morning clouds. When we go to bed, we catch a peek at the stars before we pull the shade closed. The sky is all around us. We go about our days mostly oblivious to its ever-changing currents, more focused on what’s going on in front of us, on the ground. We pay attention to the weather, but not necessarily the sky. And yet, the atmosphere above our heads is what makes the difference between whether we get up in the morning and continue our day as usual, or wake up to a natural disaster, as hurricanes or heat waves turn our world upside down. We rely on Earth’s unique atmosphere to safeguard the conditions that sustain life on this planet. So we clearly need to start paying attention to the sky above us, because it has an oversized effect on what happens to us on the ground. Otherwise, we might one day have only paintings to remind us of what was. So I began a series of paintings exploring the multitude of clouds that inhabit the life-sustaining belt around our planet. 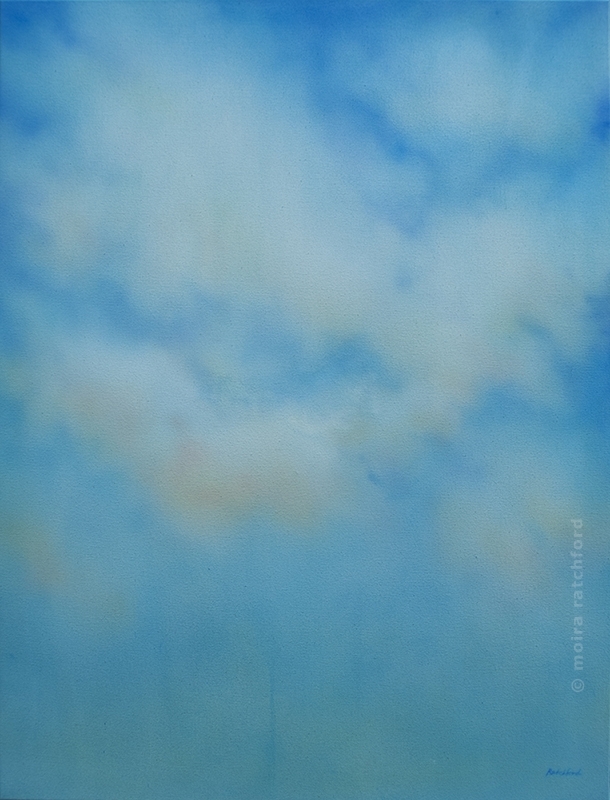 For those who spend their workday indoors, a painting like this can be your portal to the skies. It keeps you connected, and grounded, no matter what’s going on at the office. The cloud series is a happy outcome of combining airbrush with raw canvas. This technique perfectly captures the diffused, muted, and delicate shapes of clouds drifting across the sky. Layers of transparent airbrush create depth, and the tooth of the untreated canvas provides texture. Spare, simple, and beautiful. Next Next post: What I’m Working On….